If you’re currently a looter and are always hoping for more anime in your crate, then Loot Anime might be more your style. Loot Anime is the latest crate offering from the masterminds behind Loot Crate. Similar to the regular monthly Loot Crates, Loot Anime is a monthly mystery bundle packed with figures, collectibles, manga, apparel, accessories and other exclusives from popular anime and manga series revolving around a new theme every month! 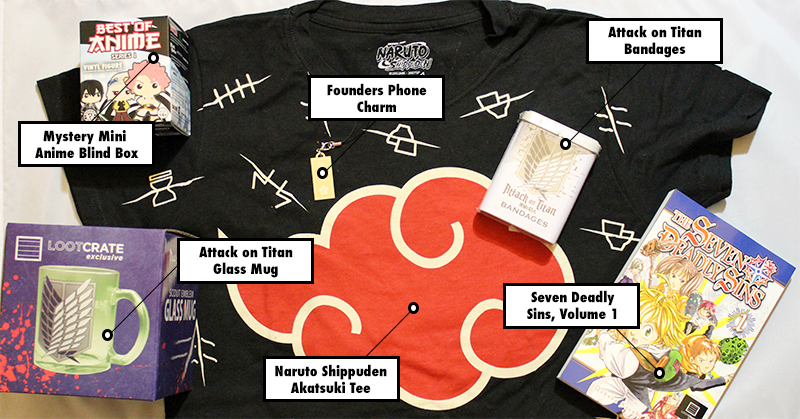 The inaugural Loot Anime box was themed Brawl and featured items from Naruto Shippuden, Attack on Titan, and Seven Deadly Sins. Additionally, since this is the first box, members were also treated to an exclusive Founders Phone Charm. What’s even cooler is the fact that there was a badass poster included which described all the contents in the Loot Anime Brawl crate. Let’s dig a little deeper into the Loot Anime Brawl crate.